Groupie Doll To Be Bred To......... TAPIT! Also Havre de Grace, Plum Pretty, and Betterbetterbetter will be bred to War Front. I think the name Hypothetical would make a great name for that foal! The Doll will have a great foal! I know I'm in the minority, but I wish she was just retired. I'm sure she is in excellent hands, I just worry. I agree with both of you. I don't think she has anything else to prove and I would hate to take the chance of her getting hurt. She's already a champion. I agree with Louise for sure. There's always this creepy feeling with "just one last race". I wish her well. I love the Doll. She deserves better. I'm still not crazy about the idea, but I wish her a safe trip. I'm hoping she's okay and stays okay. Really looking forward to a mating with Tapit. I love it when all my favorite fillies are making Slews. 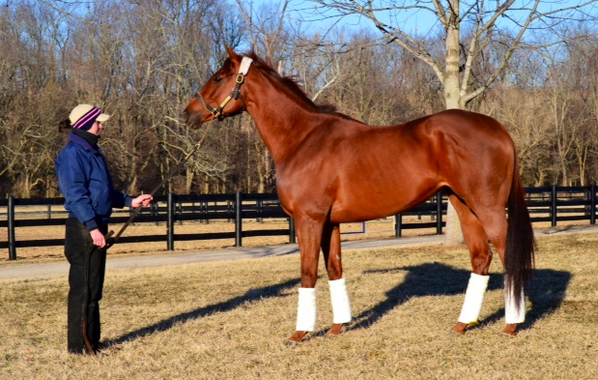 champion Groupie Doll has arrived at Timber Town and will be bred to Tapit Saturday! The Doll looks fabulous! After seeing HDG's little one from Tapit, I can only imagine what the Doll's baby will look like. God, she is just gorgeous. She's also a big girl! She's stunning. I love that she has a lot of bone and girth. Looks like she's going to produce some beautiful babies. Looking forward to seeing her first born next year! !